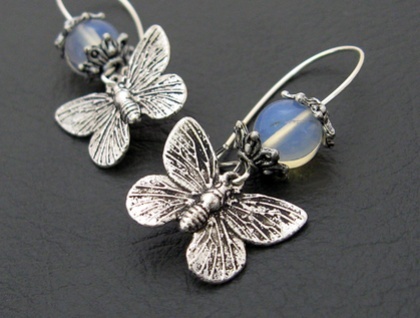 Antiqued-silver coloured moth charms hover beneath luminous, smooth rounds of moonstone framed by ornate, antiqued-silver bead caps. The moth charms have lifelike detailing on both sides. 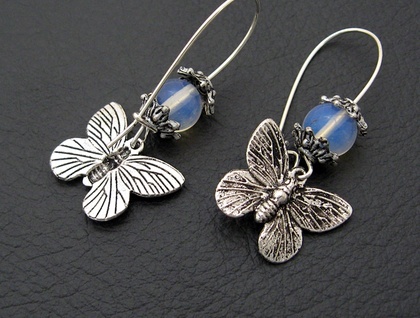 They move slightly when the earrings are worn, as though they are fluttering against the night sky. Moonstone – or hecatolite – is a semiprecious stone made of two minerals: orthoclase and albite. These two are arranged in very thin layers. When light strikes the layers, it is scattered, in an effect called 'adularescence'. This effect is what gives moonstone the luminous, moonlit glow from which it takes its name. 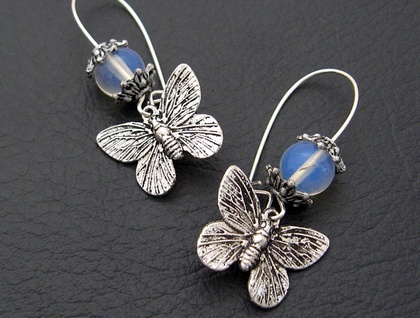 The gorgeous moonstone beads in these earrings are almost transparent, with a soft, bluish-white adularescence. Depending on the light, the stones can seem misty blue, silvery white, or glassily clear. Some of them have tiny imperfections – streaks or specks – in them, to prove that they came from the earth. 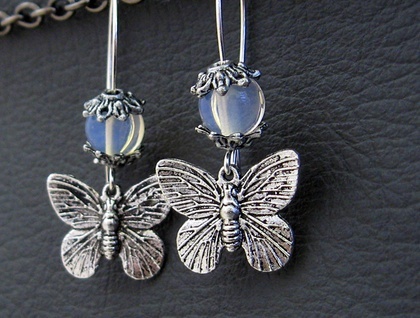 The 'Moths In Moonlight' earrings are lightweight and easy to wear. They measure 42mm from top to bottom. The little moths are 19mm across, from wingtip to wingtip. The ear-wires are made of stainless steel, plated with silver. The beads and bead caps have been simply slid onto the ear-wires, so it is recommended that you keep the ear-wires closed so that the beads do not slip off and get lost. Keeping the earrings hanging, rather than jumbled up in a jewellery box, will help to ensure that the ear-wires do not get opened or bent by other jewellery pieces pushing against them.